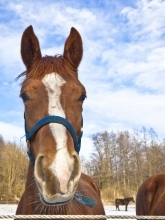 The Unwanted Horse ­ What Can We Do? The current recession has many guardians rethinking their approach to their companions´ well­being in order to make ends meet without sacrificing the quality of their care. Nowhere is the economic situation more dire than among horse owners and in the equine industry itself. A typical horse can live to his or her mid­30´s; in addition, they require thousands of dollars annually to maintain, including feed, veterinary, and farrier costs alone ­ and if the costs of stall rental and boarding care are added, the overall expense can become prohibitive. Because of this economic reality, horses who once had loving homes are sold off to horse auctions in the hopes of finding new owners; others become neglected and starved as funds dry up; owners with the hoarder propensity stop feeding the many mouths they have accumulated, often while still adding to their numbers. Additionally, instead of acting responsibly by telling their members to curtail breeding, the American Quarter Horse Association and Thoroughbred breeders encourage the production of thousands of foals (140,000 Quarter Horse and 30,000 Thoroughbreds, annually), with little consideration for the disposition of the animals who do not become successful as racers or performance horses. The problem of what to do with America´s “unwanted” horses has become a pitched battle in Congress over the passage of The Prevention of Equine Cruelty Act, H.R. 503/S.727, which would end the slaughter of horses for human consumption and prohibit the transport, international or domestic, of horses for this purpose. The bill´s opponents state that the “unwanted” horse population is soaring and that the only humane solution is to send them to slaughter to feed the European and Asian markets. Since it cannot be done in the USA (public pressure caused the closure of the last plant in 2007), horses are transported to Mexico and Canada for slaughter, compounding the horror of their suffering. Surprisingly, the very individuals who should be advocating on behalf of equine welfare to oppose this –­ the American Veterinary Medical Association, the American Association of Equine Practitioners, and the American Quarter Horse Association — ­ are the loudest proponents of the need for equine slaughter in this country. By USDA statistics, 92.3% of horses sent to slaughter are sound and in good condition. By depicting them as “unwanted”, the horse industry misrepresents them as having no other option than death. Those in support of the bill include myriad welfare groups, including NYSHA, Animal Welfare Institute, The Humane Society of the U.S., and Veterinarians for Equine Welfare; our premise is that slaughter is never humane for this head­shy, skittish species. Due to their highly evolved flight drive when frightened, they do not present an easy, still mark for the pneumatic bolt to be fired into their brain to stun them. They may be shot more than once while thrashing wildly, and may be skinned alive. While stating that slaughter is regrettable, its proponents assert that it is a humane, if sad, necessity due to the large numbers of abandoned horses. On the contrary, NYSHA states that it is inhumane, and asks if the numbers are, in fact, increasing? Since the AVMA and AAEP do not undertake to assist in neglect cases as NYSHA does routinely, they are not aware that the abandoned horse issue has always existed, even when slaughter was readily available. The problem is not that these horses are “unwanted” (as the Horse Welfare Coalition, a pro­slaughter lobbying group has labeled them), but rather that they are not placed where they can be rehomed where they are wanted. By USDA statistics, 92.3% of horses sent to slaughter are sound and in good condition. By depicting them as “unwanted”, the horse industry misrepresents them as having no other option than death. However, a spectrum of advocates has come up with practical and creative alternatives to the killing of healthy horses. In the Thoroughbred racing industry, breeders are funding sanctuaries for retired racers and some racetracks (e.g. Churchill Downs and Boston´s Suffolk Downs) have instituted a policy that no horse competing in their races may ever be sold to slaughter. Rescue groups nationwide have developed programs for rehabilitating horses saved from the “killer buyers”, training them for a wide array of events and purposes; Lynn Cross of Little Brook Farm in Chatham, N.Y. has a superb program with heart­warming successes. She rebuilds them physically and psychologically, giving them the training needed to become prized companions. In another creative project, reclaimed horses have even been used to rehabilitate our own species: the James River Correctional Facility in Virginia and New York´s Wallkill Correctional Facility allow inmates to care for retired and rescued racehorses, learning marketable skills while interacting with and caring for another being, developing empathy in the process. Such programs are wonderful as far as they go ­ but the sheer numbers of abandoned horses demand still more solutions. The ideal approach to limiting their population would be to prevent breeders from churning out thousands of foals every year, but breeding bans are very difficult to mandate, and New York is a racing state with numerous producers. Faced with excessive numbers, we therefore need to develop true euthanasia (“good death”) clinics to provide a kind final journey for a suffering or aged horse, similar to the admirable program run by NorCal Equine Rescue in Chico, CA. They provide for the humane euthanasia and disposal of the body for an affordable $25, using participating veterinarians and local rendering plants. Ideally, for horses who have no future due to illness, age or infirmity, it would be best to be euthanized on the home farm, but practically, the implementation of euthanasia clinics provides a very humane and locally available alternative, and should be supported by local equine practitioners and horse advocates to increase their availability. Equine slaughter is never humane. NYSHA asks you to contact your congressional representatives and senators, requesting their support for H.R. 503/S. 727, as well as your state assembly members and senators for their support of A. 3736 / S. 3178. Equine slaughter is never humane.